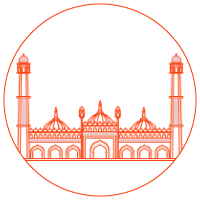 You will find this multicuisine restaurant in Radisson Blu, kaushambi. The massive space and fine dine interiors gives it a luxurious ambience. Popular for its extensive buffet spreads, Avatar is associated with luxurious meals and a wide variety. The Buffet is divided into two sections for the vegetarians and Non-vegetarians with an array of dishes to serve every palate. You can opt for their À la carte menu, in case you are here for a small bite. I stayed at Radisson for a couple of days and it was a pleasant experience. The staff at Avatar of as courteous and the food tasted well. You must try their cold coffee, it's just lovely. Apart from this, the breakfast buffet was nicely spread and the variety was good. Food and service both sucked! if you plan to visit Avatar for Al a cart please don't visit, their kama is a lot better.I infact asked for suggestion from the hotel and they suggested Avatar. When they cant serve why even open a restaurant. We visited on a Friday evening and it was that crowed.But still each and every service we received was delayed and lacked any interest and the food we got was cold and again tasted not great to us. Ruined my brother bday. Start from beginning to end had amazing time with my family.The enough non vegetarian options for non vegetarian people lover like me.Staffs were very helpful,special thanks to Sanchit,Virender and Manoj. Excellent food .. If you have been feeling gastronomically forlorn of sorts and are craving for some serious gourmet love then you should definitely head over to ‘Avatar’. This lovely fine dining restaurant is housed at Radisson Blu Hotel in Kaushambi, Delhi and is much favored for formal meetings and small family gatherings. The restaurant is known for its luxurious ambience and a relaxing chic vibe that beckons you to come back frequently. Avatar remains open 24X7 for its diners and being an all-day dining restaurant it takes special care with its menu and service. Suits having a power lunch or friends gathering for a leisurely bite at odd hours, Avatar sees it all. If you want to have a private rendezvous with somebody minus the interruptions then this elegant all-day dining restaurant will do for you admirably. 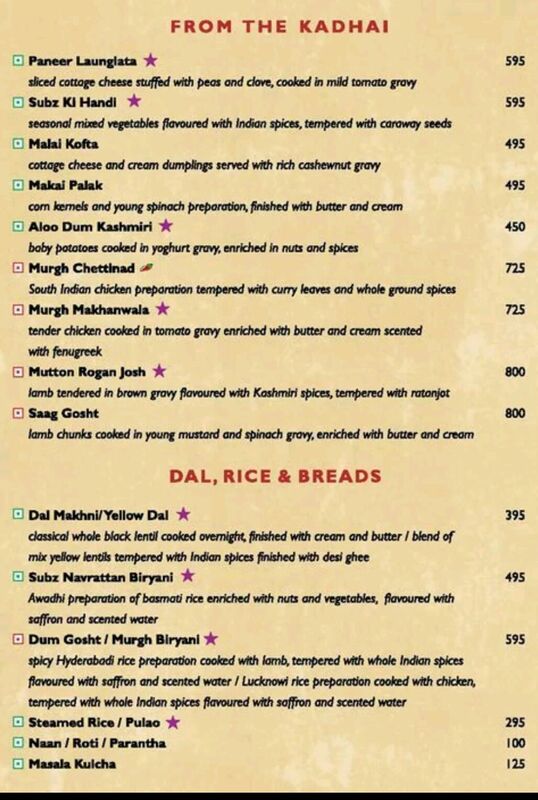 Avatar puts a lot of attention in composing a menu that is all encompassing. Keeping in mind of their varied clientele, Avatar prepares a luxurious feast of lip-smacking flavours ranging from Continental to Chinese to North Indian to Asian. 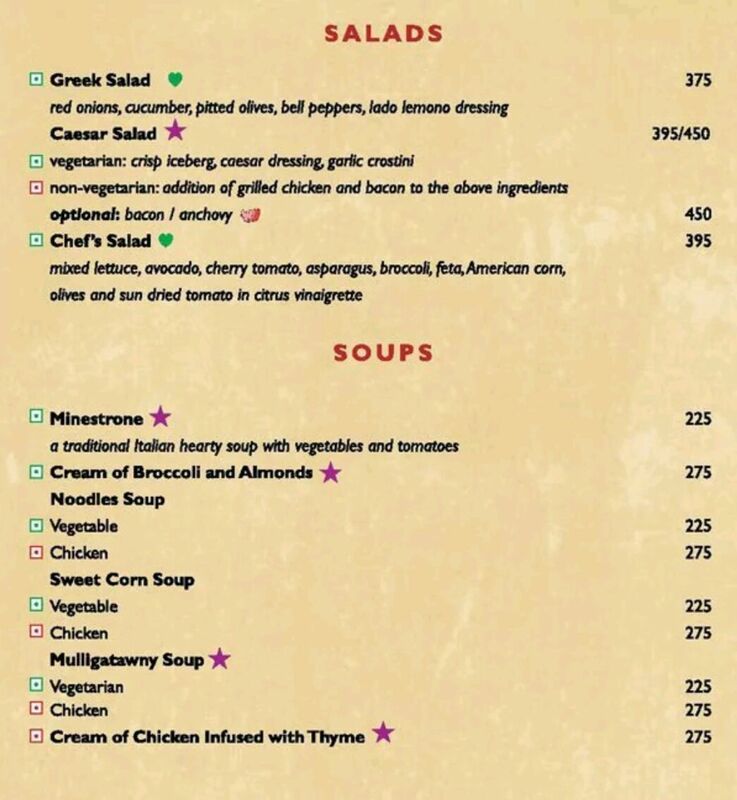 Once you glance through the menu, you will realize how crowd-pleasing it is. 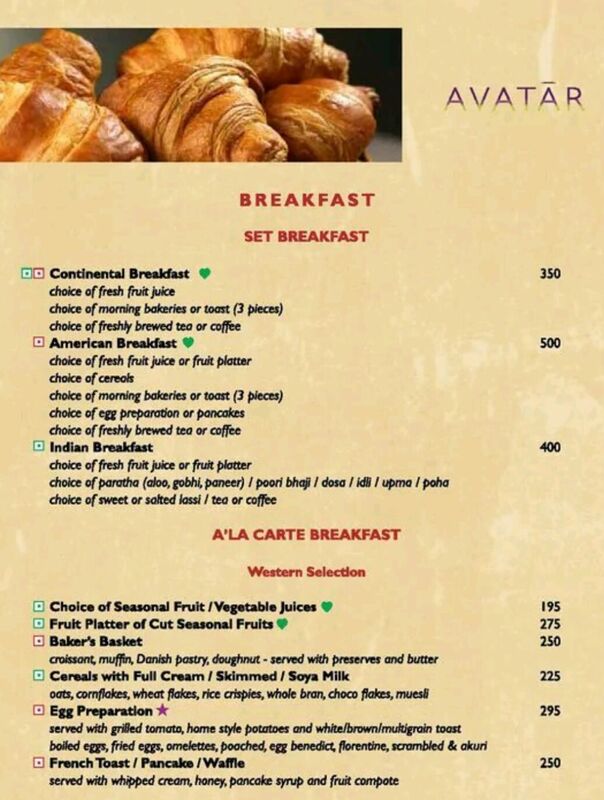 Avatar starts its day very early by offering the diners a generous vast breakfast. 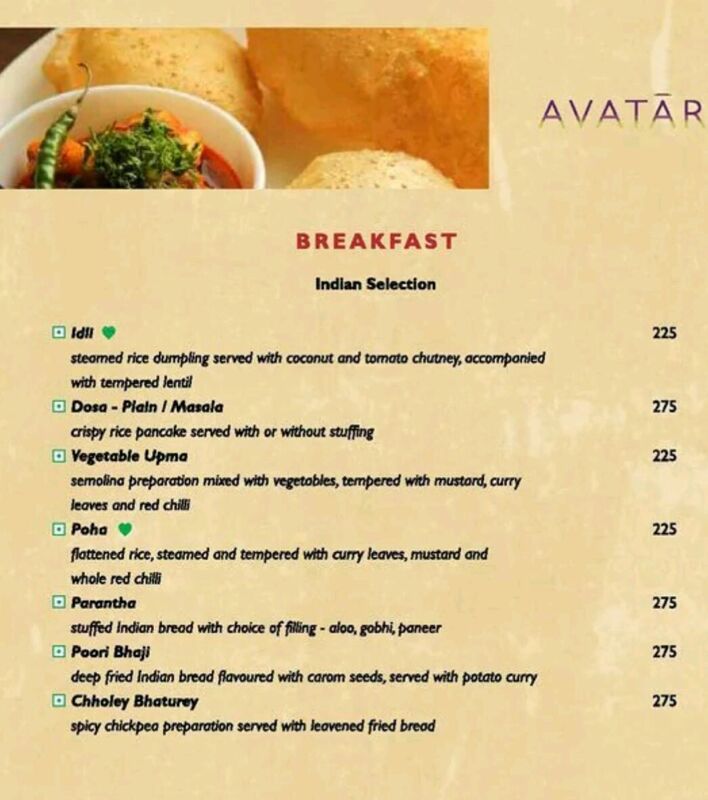 A pancake, croissant, eggs, upma, waffle, poori bhaji will go a long way into tempting your palate. Those dropping by during dinner can begin with an array of scrumptious appetizers like, quesadilla, shawarma roll, kali mirch ka paneer soola, tempura, mutton seekh gilafi and som tam. Dig in further with mains such as, batter fried cod fillet with tartar sauce, club sandwich, saag gosht, grilled jumbo prawns, kung pao chicken, nasi goreng, pepperoni pizza and Sichuan spiced chilli garlic paneer. 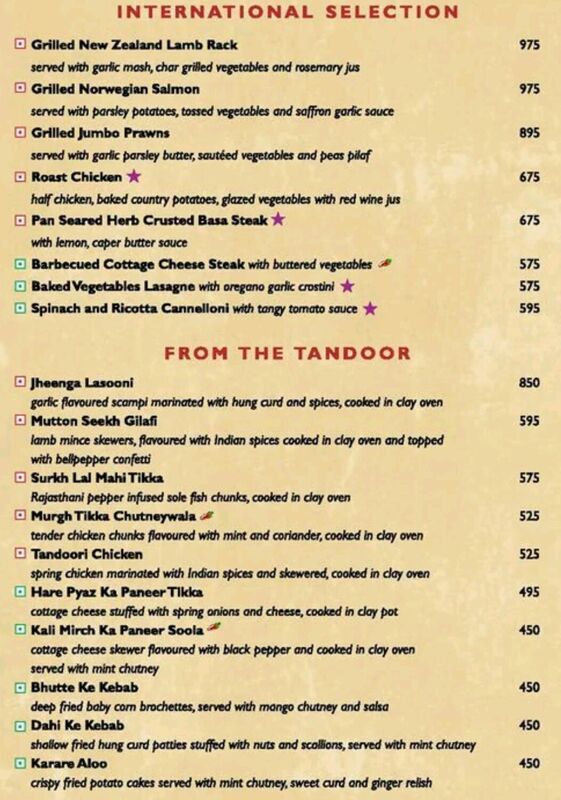 The menu is well curated and features all pleasing comforting options that are bound to go down well with every palate. Even the final sweet course is a wonderful collection of recipes from all across the globe. 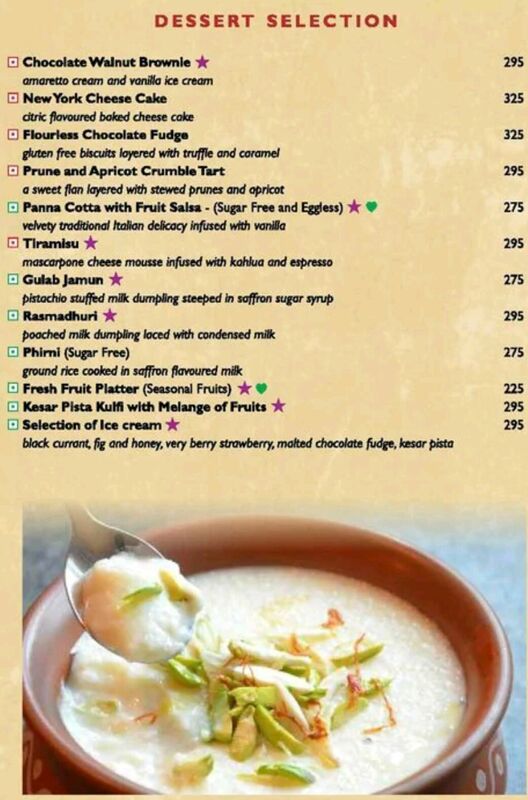 Tease your sweet tooth with, rasmadhuri, phirni, flourless chocolate fudge, kesar pista kulfi, prune & apricot crumble tart, gulab jamun, tiramisu and New York cheese cake. Hefty price tag that comes with Avatar is completely justified once you take a bite. 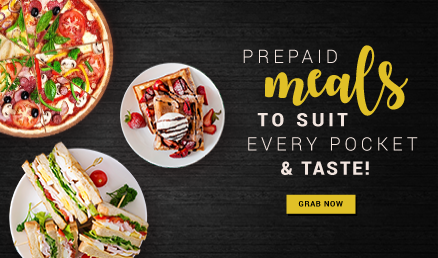 To check out the chef’s skills in full Avatar, opt for their buffet. Interior of Avatar is modern, elegant and welcoming. Comfortable good-looking dining space sprawls across the restaurant dotted with long formal tables. The idea is to make you feel right at home.